The remastered 2-disc Deluxe Editions of "Hunting High And Low" and "Scoundrel Days" were released in the UK on 5 July, in Japan on 31 July and in Germany on 6 August. They were also released in Australia, Belgium, Canada, Denmark, Finland, France, Greece, Ireland, Italy, Luxembourg, Mexico, The Netherlands, New Zealand, Norway, Portugal, Spain, Sweden and USA. Disc one of both Deluxe Editions feature the remastered album plus bonus mixes. Disc two of "Hunting High And Low" features demos, early versions and unreleased tracks, some of which are previously unreleased. Disc two of "Scoundrel Days" features demo versions and live tracks, some of which are previously unreleased. There are some additional tracks available only for download for both albums. The albums are available in jewel cases and also in special digi-paks (from Rhino Records and for purchase in Norway). The front cover of the UK remastered edition of "Hunting High And Low" comes in a jewel case with a flip tray; it is similar to the front of the original 1985 release but with a lighter grey a-ha logo. Unlike the original releases, which come with a folded insert, these deluxe releases contain instead a 10-page, double sided, booklet with some history of the band, photos and lyrics for the original album. There is a red rectangular sticker with black and white printed text located on the front of the CD case, which reads: "REMASTERED & EXPANDED with rare & unreleased gems including original 7" version of "TAKE ON ME" and demo of b-side "DRIFTWOOD". The back cover is similar to the reverse of the inside insert, which was included with the original release, but with the track listing in place of the information about compact discs. The barcode number "0 8122 79795 3 9" located at the top right hand corner and Catalogue number 8122797953 on the spine is different. The production and copyright text displayed along the bottom of the back sleeve has also been changed to read; "This Reissue ℗ & © 2010 Rhino Entertainment Company, a Warner Music Group Company. All Rights Reserved. Manufactured & Marketed by Rhino Entertainment Company, 3400 W. Olive Ave., Burbank, CA 91505-4614. Unauthorized copying, hiring, lending, public performance, and broadcasting of this recording prohibited. Printed in E.U. LC02982 www.rhino.com". The "WB RECORDS" and "RHINO" logos are additionally included in the bottom right hand corner. 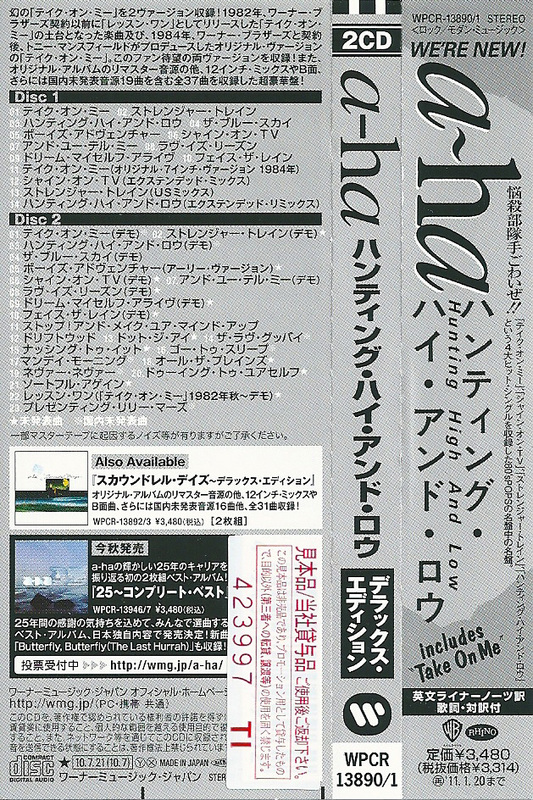 The discs are white with printed 'pencil horizontal and vertical lines plus the a-ha logo in grey with the title and disc 1 / 2 in red letters. Disc One has a red ring round the centre of the disc, while Disc Two has a grey ring. When looking through the clear plastic tray, you can see a cartoon drawing of the band (Paul, Morten and Magne) displayed on the inside of the back sleeve. 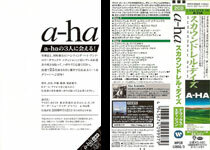 The European digipak edition is similar to the UK jewel case edition with the same 10-page booklet and white coloured discs, but on the outside front cover, the a-ha logo is printed in dark grey on grey, rather than white on grey which appears on the booklet. The same red rectangular sticker with black and white text, which appears on the UK jewel case edition, is included at the bottom of the front cover. The track "The Sun Always Shines On T.V. (Extended Mix)" is the rare version by Alan Tarney, which was previously unreleased onto CD, not the mix by Steve Thompson. On the back sleeve, the same layout including full track listing, black and white photos of the three band members and production and copyright text is shown, but the digipak comes with a larger barcode displaying a different number "0 81227 97999 7" in the top right hand corner. The Catalogue number 8122797999 shown on the spine is again different compared to the one included on the original release and the remastered UK jewel case edition. The two-fold digipak opens out to reveal the two discs which sit in transparent trays through which "Take On Me" style black and white drawings can be seen through. The reverse of the pocket, which houses the booklet, has a 'negative' style black and white shot of the band in front of a mirror. The regular black and white version of this shot is printed and included on the inside back cover of the digipak. There is a UK promo edition of the album, which comes with a folded insert in a clear PVC wallet. The front of the insert is similar to the cover of the regular edition. 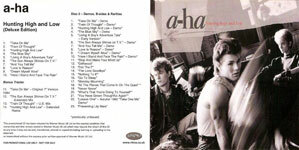 The reverse is white with "a-ha Hunting High and Low (Deluxe Edition)" printed in black in the top left hand corner. The full track listing is included down the left and right hand sides again in black, with some previously unissued songs. Along the bottom, there is some other production and copyright information; "This promotional CD has been released by Warner Music UK Ltd on the express condition that ownership and title remain vested in Warner Music UK Ltd which may require the return of this CD at any time. It may not be sold, transferred, altered or copied (including burning or uploading to the internet) or transmitted without the express prior written approval of Warner Music UK Ltd". It also shows that the CD was "FOR PROMOTIONAL USE ONLY – NOT FOR SALE. ", and the "RHINO" logo and website address "www.rhino.co.uk" is included in the bottom right hand corner. 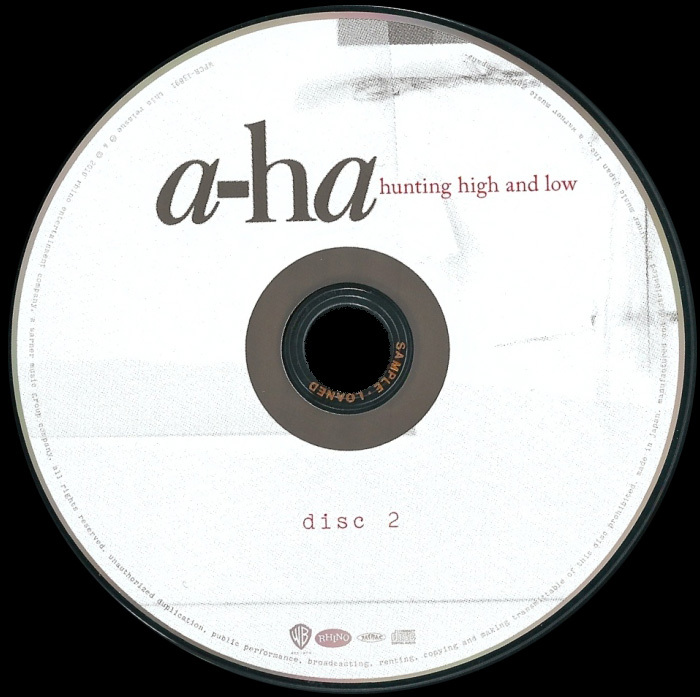 The discs are silver with black text, the title "a-ha Hunting High and Low (Deluxe Edition)" with "Disc One" or "Disc Two" is printed along the top. The same production and copyright text which appears on the reverse of the insert is printed at the lower half of each disc, along with the same information "FOR PROMOTIONAL USE ONLY – NOT FOR SALE" and the "RHINO" logo and website address details. The front cover of the UK remastered edition of "Scoundrel Days" comes with a jewel case containing a flip tray. 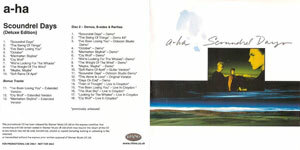 It is similar to the front of the original 1986 release of the album displaying the regular artworks, but shown from more of a distance and with the title "a-ha Scoundrel Days" displayed handwritten in the centre of the sleeve, rather than located along the top. There is a green rectangular sticker with black and white printed text located on the front of the CD case, which reads: "REMASTERED & EXPANDED With Rare & Unreleased Gems Including Demos or Alternate Versions of Each Album Track Plus Unreleased Live Performances of "TRAIN OF THOUGHT," "THE BLUE SKY," and "CRY WOLF" 8122797951". The back cover is also similar, but printed in darker colours and includes the additional tracks listed in light green for disc 1 and dark green for disc 2. The barcode number "08122 79795 1 5" located at the top right hand corner and Catalogue number 8122797951 on the spine is different. The production and copyright text displayed along the bottom of the back sleeve has also been changed to read; "*PREVIOUSLY UNISSUED ORIGINAL ALBUM PRODUCED BY ALAN TARNEY, MAGS AND PAUL WAAKTAAR-SAVOY This Reissue ℗ & © 2010 Rimo Entertainment Company, a Warner Music Group Company. All Rights Reserved. Manufactured & Marketed by Rhino Entertainment Company, 3400 W. Olive Ave., Burbank, CA 91505-4614. Unauthorized copying, hiring, lending, public performance, and broadcasting of this recording prohibited. Printed in E.U. LC02982 www.rhino.com". The "WB RECORDS" and "RHINO" logos are additionally included in the bottom left hand corner. The inside of the album includes instead a 18 page, double sided, colour booklet (rather than the long fold-out insert) with some history of the band, photos and lyrics for the original album. The layout and design has varied slightly and does not include the long landscape scene artwork. On the inside of the back sleeve when looking through the clear plastic tray, you can see an image of a coffee stain. 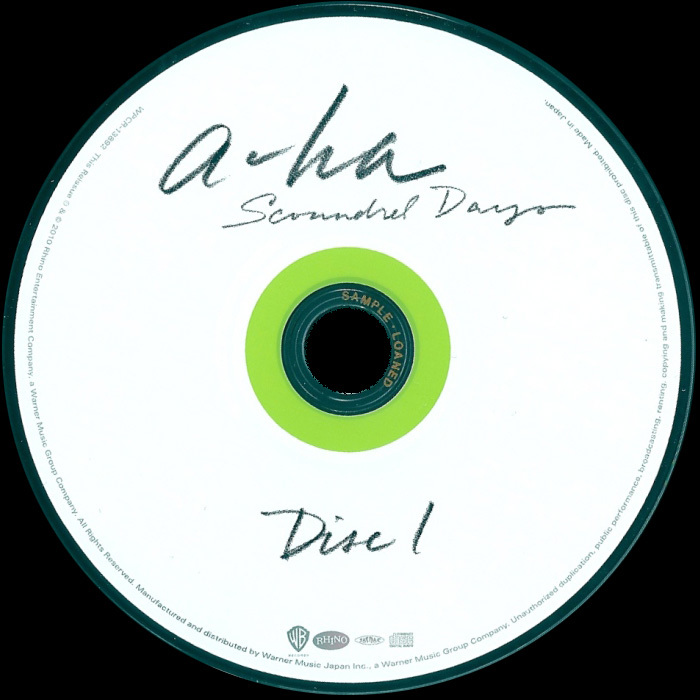 The discs are plain white with the a-ha logo and title "Scoundrel Days" handwritten and printed in black crayon along the top. Below the centre ring again handwritten and printed in the same black crayon is either "Disc 1" or "Disc 2". disc 1 additionally has a lime green ring round the centre of the disc, while disc two has instead an orange centre ring. There is some similar production and copyright information displayed around the bottom outer rim of both discs which is included on the back sleeve; "8122797951 This Reissue ℗ & © 2010 Rhino Entertainment Company, a Warner Music Group Company. All Rights Reserved. Manufactured & Marketed by Rhino Entertainment Company. Made in E.U. LC02982". The silver "WB RECORDS" and "RHINO" logs are also included. The European digipak edition is very similar to the UK jewel case release with the same cover design but slightly cropped in size, it also contains the same 18-page booklet and discs. On the front sleeve, the image of the blue ink blotch is embossed unlike the one on the UK jewel case edition. The same green "REMASTERED & EXPANDED" rectangular sticker with black and white text, which appears on the jewel case edition, is included at the bottom of the front cover. On the back sleeve, the same layout including full track listing in light and dark green text, colour photo of the three band members and landscape scene are shown, along with the same production and copyright text displayed at the bottom of the sleeve., but the digipak comes with a larger barcode displaying a different number "0 81227 97999 7" in the top right hand corner. The Catalogue number 8122797999 shown on the spine is again different compared to the one included on the original release and the remastered UK jewel case edition. The two-fold digipak opens out to reveal the two discs which sit in transparent trays through which an ink blotch and a green tone shot of the band silhouetted against the sky. The reverse of the pocket which houses the booklet has a small shot of the band taken from the "Cry Wolf" photo shoot plus an additional long thin cross section of another picture from the same photo shoot. These are over a white background with another ink blotch. Another shot from the same photo shoot is printed on the inside back of the digipak. Disc 2 features 5 live tracks from the "live in Croydon" show. 4 are previously unreleased. "We're Looking For The Whales" was released before on the 7" (abridged) and 12" (full) singles "Manhattan Skyline", the former also found on "Scoundrel Club". The recording was edited to remove the high-pitched tone (likely a feedback) heard on those releases. There is a UK promo edition of "Scoundrel Days", which comes with a folded insert in a clear PVC wallet. The front of the insert is similar to the cover of the regular edition. 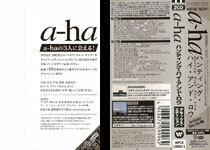 The reverse is white with "a-ha Scoundrel Days (Deluxe Edition)" printed in black in the top left hand corner. The full track listing is included down the left and right hand sides again in black, with some previously unissued songs. Along the bottom, there is some other production and copyright information; "This promotional CD has been released by Warner Music UK Ltd on the express condition that ownership and title remain vested in Warner Music UK Ltd which may require the return of this CD at any time. It may not be sold, transferred, altered or copied (including burning or uploading to the internet) or transmitted without the express prior written approval of Warner Music UK Ltd". It also shows that the CD was "FOR PROMOTIONAL USE ONLY – NOT FOR SALE. ", and the "RHINO" logo and website address "www.rhino.co.uk" is included in the bottom right hand corner. 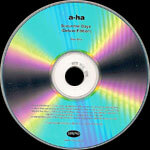 The discs are silver with black text, the title "a-ha Scoundrel Days (Deluxe Edition)" with "Disc One" or "Disc Two" is printed along the top. The same production and copyright text which appears on the reverse of the insert is printed at the lower half of each disc, along with the same information "FOR PROMOTIONAL USE ONLY – NOT FOR SALE" and the "RHINO" logo and website address details. The Brazilian deluxe editions of "Hunting High And Low" and "Scoundrel Days" were released by "Sonopress under license to Warner Music Brasil Ltda", both are very similar to the European releases containing the regular album artworks and same full track listings, but without the rectangular red or green "REMASTERED & EXPANDED" sticker on the front of the CD cases. The barcode numbers on the back sleeves are the same as the European editions, but the manufacturing, distributing and copyright information displayed at the bottom of the back sleeves has changed, and is printed mainly in Portuguese; "© ℗ 2010 Rhino Entertainment Company, a Warner Music Group Company, for the U.S. & WEA International Inc. for the world outside of the U.S. All Rights Reserved. Warner Music Brasil Ltda. uma empresa Warner Music Group. Produzido no Polo Industrial de Manaus e distribuido por Sonopress Rimo Ind. e Com. Fonog. S.A.- Ind. Bras Rua Ica, no 100-A – Distrito Industrial – Manaus – AM – CNPJ 67.562.884/0004-91. Sob Licenca de Warner Music Brasil Ltda. – CNPJ 42.470.112/0012-09. Todos os direitos reservados. Proibida a reproducao, execucao publica e locacao desautorizadas sob as penas da lei. O prazo de validade do disco CD ou DVD e indeterminado desde que observado os seguintes cuidados: Armazenar em local seco, livre de poeira, nao expor ao sol, nao riscar, nao dobrar, nao engordurar, nao manter a uma temperatura superior a 55oC e umidade acima de 60g/m3 e segurar o disco sempre pela lateral e pelo furo central. DISCO E CULTURA. Denuncie a pirataria: [email protected]". Also displayed on the back sleeve of each album is the regular "WB RECORDS" and "RHINO" logos, plus additional "COMPACT disc DIGITAL AUDIO" and "PRODUZIDO NO POLO INDUSTRIAL DE MANAUS" flying Amazon bird logos. Two "www.warnermusic.com.br" and "www.warnermusicstore.com.br" website addresses are also included. The inside of the albums both include the same appropriate European deluxe colour lyric booklets. The discs on the "Hunting High And Low" Brazilian edition come with the regular white coloured discs, with the a-ha logo in grey and title "hunting high and low" in red along the top, "disc 1" or "disc 2" has been printed again in red below the centre ring. The "PRODUZIDO NO POLO INDUSTRIAL DE MANAUS" flying Amazon bird, "COMPACT disc DIGITAL AUDIO", "WB RECORDS" and "RHINO" logos are additionally included in silver along the bottom of both discs. Around the outer rim of each disc is some further Brazilian production and copyright information which is similar to that shown on the back sleeve; "© ℗ 2010 Rhino Entertainment Company. Warner Music Brasil Ltda. Produzido no Polo Industrial de Manaus e distribuido por Sonopress Rimo Ind. e Com. Fonog. S.A. – Ind. Bras – CNPJ 67.562.884/0004-91. Sob Licenca de Warner Music Brasil Ltda. – CNPJ 42.470.112/0012-09. Todos os direitos reservados. Prohibida a reproducao, execucao publica e locacao desautorizadas sob as penas da lei. 8122797951". Around the centre ring of each disc, the colouring is somewhat darker compared to the European discs with disc 1 being dark red and disc 2 being dark grey. The discs on the "Scoundrel Days" Brazilian edition include the regular white discs with the pencil-handwritten titles along the top, and either "disc 1" or "disc 2" handwritten below the centre ring. The "PRODUZIDO NO POLO INDUSTRIAL DE MANAUS" flying Amazon bird, "COMPACT disc DIGITAL AUDIO", "WB RECORDS" and "RHINO" logos are additionally included in silver at the bottom of both discs. Around the outer rim of each disc is the regular Brazilian production and copyright information which appeared on the Brazilian "Hunting High And Low" deluxe edition and is similar to that shown on the back sleeve; "© ℗ 2010 Rhino Entertainment Company. Warner Music Brasil Ltda. Produzido no Polo Industrial de Manaus e distribuido por Sonopress Rimo Ind. e Com. Fonog. S.A. – Ind. Bras – CNPJ 67.562.884/0004-91. Sob Licenca de Warner Music Brasil Ltda. – CNPJ 42.470.112/0012-09. Todos os direitos reservados. Prohibida a reproducao, execucao publica e locacao desautorizadas sob as penas da lei. 8122797951". Around the centre ring of each disc, the colouring is again somewhat darker compared to the European discs with disc 1 being dark green and disc 2 being dark orange. There is also some batch issue coding displayed around the centre ring of each disc and on one side of the spines. At least two different copies of each album are known to exist; AA0001000 and AB0001000. The Japanese deluxe editions of "Hunting High And Low" and "Scoundrel Days" come with an obi-strip plus additional black and white paper booklet with the lyrics in Japanese. Both albums have three stickers on the front of the cellophane, the largest is pink and white with Japanese text and there is a smaller blue "Summer Sonic" one with white text and a white "40 Anniversary Warner Music Japan" one with grey and blue text. The actual discs and covers are very similar to the European editions, except for the catalogue numbers and the bar codes have been excluded. 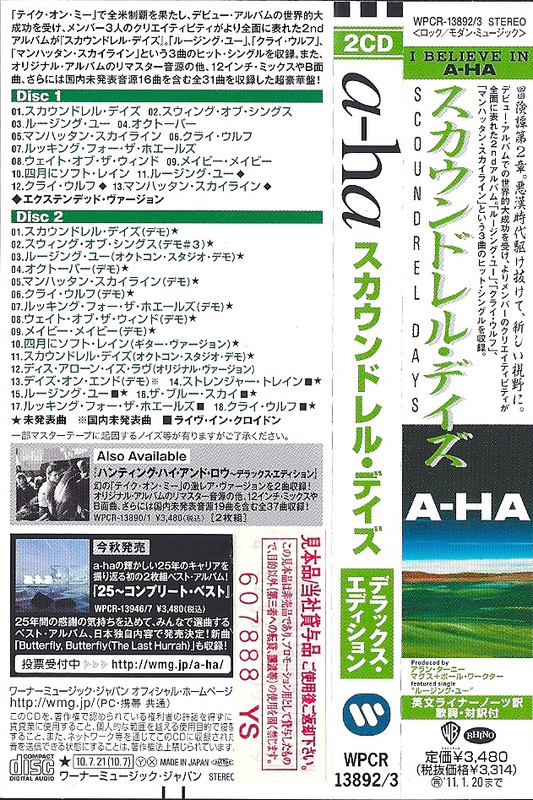 The "Hunting High And Low" obi strip is grey with black text plus small coloured shots of the album covers of "Scoundrel Days" and "25". The reverse side of the obi is white with black text. The "Scoundrel Days" obi strip is white with green and black text plus an extract of the "Scoundrel Days" scenic artwork across the spine plus coloured shots of the album covers of "Hunting High And Low" and "25". The reverse side is very similar to the reverse of the "Hunting High And Low" obi but has a different catalogue number and a "2" in the bottom right corner, rather than a "1". Promo copies of the album have an additional white and red promo sticker on the back of the obi strips and have the text "SAMPLE LOANED" etched into the centre rings of the discs. The promo deluxe editions of "Hunting High And Low" and "Scoundrel Days" were released by COMP MUSIC in the Ukraine and come in jewel cases, rather than clear PVC wallet sleeves. The back sleeves on both albums are similar to the front sleeves displaying the regular artworks, but coming with cropped images on each one. The titles shown along the top of the back sleeves are somewhat bigger than on the front. The full track listing to each album is included in black text and overdubbed on top of the back sleeve artworks, in order to make two separate columns for each disc. There is some Ukrainian text; "Подарункове видання НЕ ДЛЯ ПРОДАЖУ – NOT FOR SALE" included under the first column, which translates to "Gift Edition NOT FOR SALE". Along the bottom of the back sleeve again on both deluxe editions is some other Ukrainian promotional use only and copyright information with the English translation included underneath; "ТІЛЬКИ ДЛЯ НЕКОМЕРЦІЙНОГО ВИКОРИСТАННЯ. ПРОДАЖ АБО ПЕРЕДАЧА В ІНШІЙ ФОРМІ ЗАБОРОНЕНІ. КОПІЯ ПОВИННА БУТИ ПОВЕРНЕНА НА ВИМОГУ РЕКОРДІНГОВОІ КОМПАНІІ. FOR PROMOTIONAL USE ONLY. SALE OR OTHER TRANSFER IS PROHIBITED. MUST BE RETURNED ON DEMAND OF RECORDING COMPANY". The COMP MUSIC record company logo is additionally included at the bottom right hand corner. Both releases come without any regular red or green rectangular stickers on the front of the CD cases, but instead include some other additional Ukrainian unreleased track information again in black and printed along the bottom of each front sleeve. On the Hunting High And Low edition it displays; "Подарункове видання дебютного альбому a-ha "Hunting High And Low" відкриває декілька прихованих скарбів, таких як інструментальна версія "Take On Me" і рання версія тієї ж пісні під назвою "Lesson One"; демо-версії пісень "The Sun Always Shines On TV" та "Train Of Thought"; улюблений шанувальниками бі-сайд "Driftwood", а також композиииції, випущені раніше тільки в Норвегії "Never Never" та "Dot The I" which translates to; "The a-ha "Hunting High And Low" debut album presents several hidden treasures, such as the instrumental version of "Take On Me" and an early version of the same song entitled "Lesson One"; demo version of the songs "The Sun Always Shines On TV" and "Train Of Thought"; beloved admirers of the "Driftwood" b-side, as well as compositions released previously only in Norway "Never Never" and "Dot The I". Whilst on the Scoundrel days edition it includes; "У подарункове видання альбому a-ha "Scoundrel Days" включені демо-версїі кожного альбомного треку; бі-сайд "This Alone Is Love", а також раніше невидані концертні записи "Train Of Thought," "I’ve Been Losing You", "Blue Sky" and "Cry Wolf", які були записані у Англїі." which translates to "The gift edition of the a-ha album Scoundrel Days includes a demo version of each album track; the b-side "This Alone Is Love", as well as the previously untapped "Train Of Thought", "I've Been Losing You", "Blue Sky" and "Cry Wolf" tracks recorded in England". On the spines, the title "a-ha Hunting High and Low" or "a-ha Scoundrel Days" is printed in black and displayed landscaped in the centre with the Record Company name "Комп М'юзік" (Comp Music) printed in Ukrainian. The discs on both albums are silver with black text, displaying a-ha and title "Hunting High and Low" or "Scoundrel Days" along the top with Gift Edition "(Подарункове видання)" and Disc 1 "Диск 1" or Disc 2 "Диск 2" printed in Ukrainian underneath. The full track listing to each album is included below the centre ring along with "НЕ ДЛЯ ПРОДАЖУ – NOT FOR SALE" and the COMP MUSIC Record Company logo. Around the bottom rim of each disc is the same promotional and copyright Information (again printed and displayed in both English and Ukrainian), which appears on the back sleeve of each album. The inside of the albums is just plain white and does not include the regular colour booklets or any other artwork. Both albums also do not contain any Catalogue Numbers. There are U.S. promo acetate copies of the deluxe albums, produced 26 March 2010. They come in a jewelcase with insert. The front of the insert is white with blue text at the top "DigiPrep Mastering" plus contact details in Los Angeles. "Warner Music Group" is printed in black under the blue titles plus the title and "ref disc only, not for mfg 3/26/10". The back insert is white with titles in black at the top and the tracks listed underneath. 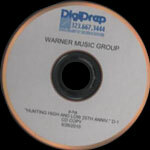 The disc is white with blue DigiPrep titles at the top plus "Warner Music Group" and album titles underneath. The regular U.S. deluxe edition of "Scoundrel Days" also came in a digipak and is virtually the same as the European release, coming with the same artwork and layout including the ink blotch on the front sleeve, but without the additional green "REMASTERED & EXPANDED" rectangular sticker. On the back sleeve, the same barcode number "0 81227 98000 9" as the European release is included, but the production and copyright information displayed along the bottom of the sleeve has been slightly amended to show that the album was printed in the USA; "This Reissue ℗ & © 2010 Rhino Entertainment Company, a Warner Music Group Company. All Rights Reserved. Manufactured & Marketed by Rhino Entertainment Company. 3400 W. Olive Ave., Burbank, CA 91505-4614. Printed in U.S.A. www.rhino.com. FBI Anti-Piracy Warning: Unauthorized copying is punishable under federal law". There is an additional "FBI ANTI-PIRACY WARNING DEPARTMENT OF JUSTICE FEDERAL BUREAU OF INVESTIGATION" copyright symbol, which has been added to the bottom right-hand corner, this symbol is not included on the European release. The inside of the remastered album, (like the European release) includes the same two-fold digipak opening up to reveal the two discs, which again sit in transparent trays, through which an ink blotch and green tone shot of the band silhouetted against the sky. The reverse of the pocket, which houses the booklet, has a small shot of the band taken from the "Cry Wolf" photo shoot plus an additional long thin cross section of another picture from the same photo shoot. These are over a white background with another ink blotch. Another shot from the same photo shoot is included on the inside back of the digipak. 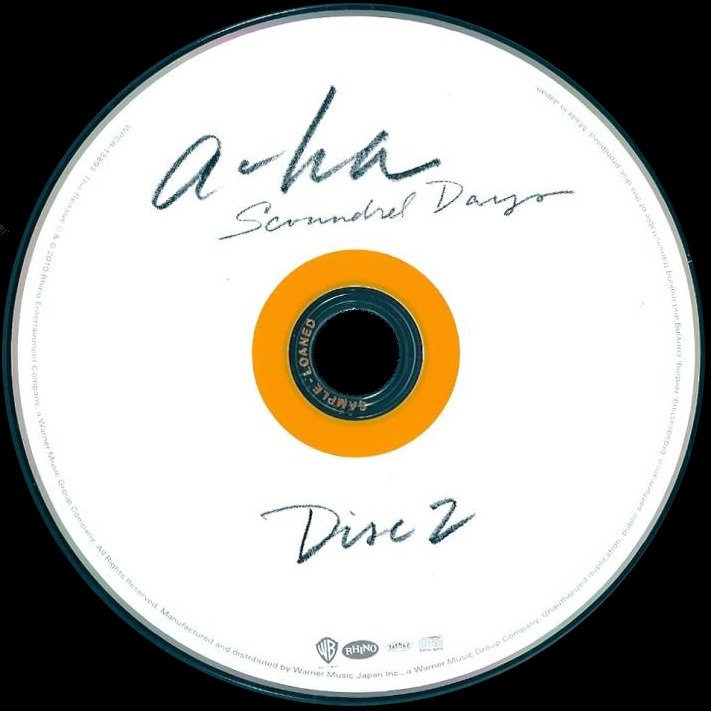 The discs are white with the grey handwritten title "a-ha Scoundrel Days" included along the top on each one, "Disc 1" or "Disc 2" is shown along the bottom. The regular silver "WB" and "RHINO" logos are on display at the bottom on each. Around the outer rim at the bottom of each disc is the US manufacturing, production and FBI Anti-Piracy Warning copyright information which is similar to that shown on the back sleeve; it also includes the revised US Catalogue number; "R2 524674 This Reissue ℗ & © 2010 Rhino Entertainment Company, a Warner Music Group Company. All Rights Reserved. Manufactured & Marketed by Rhino Entertainment Company. Made in U.S.A. FBI Anti-Piracy Warning: Unauthorized copying is punishable under federal law". Like the European discs, the centre ring of disc one is coloured light green and the centre ring of disc two is instead coloured orange. The revised US Catalogue number R2 524674 is included on the back of the colour booklet.